BACKGROUND: Platelet dysfunction may be one of the pathophysiologic complications in beta-thalassemia patients. However, the results obtained from the platelet aggregation vary in different types of β-thalassemia and among patients. OBJECTIVE: We evaluated the platelet function to determine risk of thrombosis in two groups': beta-thalassemia major (TM) and intermedia (TI). MATERIALS AND METHODS: In a cross-sectional study, platelets of 82 adult patients with beta-thalassemia (46 β-TM and 36 β-TI) who had undergone splenectomy and 85 normal healthy individuals as control were induced by collagen 10 μ g/ml, adenosine diphosphate (ADP) 20 μ M/l, arachidonic acid 500 μ M/l, and ristocetin 1500 μ g/ml. Independent t-test was used to compare the mean values using SPSS 16. P < 0.05 was taken to indicate statistical significance. RESULTS: Although a significant increase was observed in the platelet aggregation by collagen, ADP, and arachidonic acid in β-TM patients as compared with healthy controls, the β-TI patients showed no difference (P < 0.05). There was no significant alteration in response to ristocetin in β-TM but it reduced in β-TI. CONCLUSIONS: The platelet aggregation in β-TM patients is more than β-TI, both of whom splenectomized. The platelet aggregation in beta-thalassemia might be impressed by transfusion. Given these changes, thrombotic risk should be considered in beta-thalassemia patients. The mean age of our patients was 29.9 ± 10.5 years. 35 (43%) patients were male and 47 (57%) were female. [Table 1] shows the characteristics of patients. [Figure 1] shows the percentage of the platelet aggregation with agonists. [Table 2] presents the mean percentage of platelet aggregation in the groups. In the group with β-TM, the mean percentage of the platelet aggregation was significantly (P < 0.05) increased on induction with collagen, ADP, and arachidonic acid as compared to the controls, but ristocetin had no effect on platelet agglutination. In contrast to β-TM, the TI group showed no increase in platelet aggregation induced by these agonists, but platelet agglutination with ristocetin decreased significantly as compared to the control group. 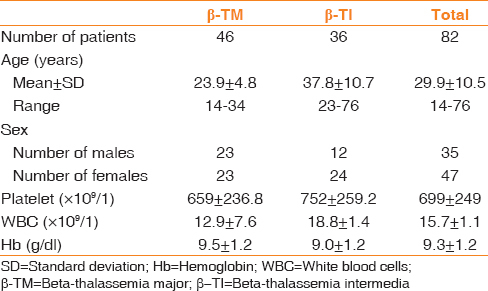 It is apparent from [Table 3] that patients' platelets with TM are aggregated more than intermedia, except when induced with ADP. Zahedpanah M, Azarkeyvan A, Hajibeygi B, Ahmadinezhad M, Eshghi P, Tabatabaei MR, et al. Coagulation inhibitors in thalassemia. Sci J Iran Blood Transfus Organ 2010;7:78-8. Sirachainan N. Thalassemia and the hypercoagulable state. Thromb Res 2013;132:637-41. Cappellini MD, Robbiolo L, Bottasso BM, Coppola R, Fiorelli G, Mannucci AP, et al. Venous thromboembolism and hypercoagulability in splenectomized patients with thalassaemia intermedia. Br J Haematol 2000;111:467-73. Cappellini MD, Grespi E, Cassinerio E, Bignamini D, Fiorelli G. Coagulation and splenectomy: An overview. Ann N Y Acad Sci 2005;1054:317-24. Sumiyoshi A, Thakerngpol K, Sonakul D. Pulmonary microthromboemboli in thalassemic cases. Southeast Asian J Trop Med Public Health 1992;23 Suppl 2:29-31. Eldor A, Rachmilewitz EA. The hypercoagulable state in thalassemia. Blood 2002;99:36-43. Chaudhary HT, Ahmad N. Frequency of platelet aggregation defects in children suffering fromg β-thalassemia. Saudi J Health Sci 2012;1:92. Shebl SS, el-Sharkawy HM, el-Fadaly NH. Haemostatic disorders in nonsplenectomized and splenectomized thalassaemic children. East Mediterr Health J 1999;5:1171-7. Orudzhev AG, Guseĭnova EE, Khalilova IS, Dzhavadov SA. Assessment of endogenous intoxication and thrombocyte functions in beta-thalassemia. Klin Lab Diagn 2003;3:39-41. Setiabudy R, Wahidiyat PA, Setiawan L. Platelet aggregation and activation in thalassemia major patients in indonesia. Clin Appl Thromb Hemost 2008;14:346-51. Atichartakarn V, Angchaisuksiri P, Aryurachai K, Chuncharunee S, Thakkinstian A.In vivo platelet activation and hyperaggregation in hemoglobin E/beta-thalassemia: A consequence of splenectomy. Int J Hematol 2003;77:299-303. Opartkiattikul N, Funahara Y, Fucharoen S, Talalak P. Increase in spontaneous platelet aggregation in beta-thalassemia/hemoglobin E disease: A consequence of splenectomy. Southeast Asian J Trop Med Public Health 1992;23 Suppl 2:36-41. Laosombat V, Wongchanchailert M, Kenpitak K, Wisitpongpon C. Spontaneous platelet aggregation in thalassemic children and adolescents. Southeast Asian J Trop Med Public Health 1992;23 Suppl 2:42-6. Zahedpanah M, Azarkeivan A, Aghaieepour M, Nikogoftar M, Ahmadinegad M, Hajibeigi B, et al. Erythrocytic phosphatidylserine exposure and hemostatic alterations in β-thalassemia intermediate patients. Hematology 2014;19:472-6. Atichartakarn V, Angchaisuksiri P, Aryurachai K, Onpun S, Chuncharunee S, Thakkinstian A, et al. 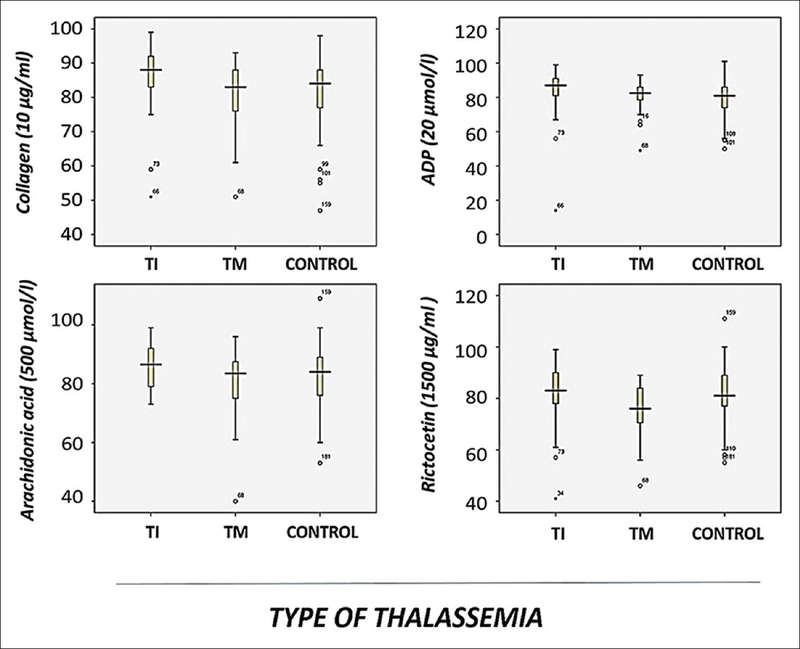 Relationship between hypercoagulable state and erythrocyte phosphatidylserine exposure in splenectomized haemoglobin E/beta-thalassaemic patients. Br J Haematol 2002;118:893-8. Kuypers FA, de Jong K. The role of phosphatidylserine in recognition and removal of erythrocytes. Cell Mol Biol (Noisy-le-Grand) 2004;50:147-58. Brown GE, Ritter LS, McDonagh PF, Cohen Z. Functional enhancement of platelet activation and aggregation by erythrocytes: Role of red cells in thrombosis. Peer J Preprints 2014;2:e351v. Chung SM, Bae ON, Lim KM, Noh JY, Lee MY, Jung YS, et al. Lysophosphatidic acid induces thrombogenic activity through phosphatidylserine exposure and procoagulant microvesicle generation in human erythrocytes. Arterioscler Thromb Vasc Biol 2007;27:414-21. Triantafyllou AI, Vyssoulis GP, Karpanou EA, Karkalousos PL, Triantafyllou EA, Aessopos A, et al. Impact of β-thalassemia trait carrier state on cardiovascular risk factors and metabolic profile in patients with newly diagnosed hypertension. J Hum Hypertens 2014;28:328-32. Atichartakarn V, Chuncharunee S, Archararit N, Udomsubpayakul U, Aryurachai K. Intravascular hemolysis, vascular endothelial cell activation and thrombophilia in splenectomized patients with hemoglobin E/β-thalassemia disease. Acta Haematol 2014;132:100-7. Helms CC, Marvel M, Zhao W, Stahle M, Vest R, Kato GJ, et al. Mechanisms of hemolysis-associated platelet activation. J Thromb Haemost 2013;11:2148-54. Andrews DA, Low PS. Role of red blood cells in thrombosis. Curr Opin Hematol 1999;6:76-82. Silvain J, Abtan J, Kerneis M, Martin R, Finzi J, Vignalou JB, et al. Impact of red blood cell transfusion on platelet aggregation and inflammatory response in anemic coronary and noncoronary patients: The TRANSFUSION-2 study impact of transfusion of red blood cell on platelet activation and aggregation studied with flow cytometry use and light transmission aggregometry. J Am Coll Cardiol 2014;63:1289-96. Leichtman DA, Brewer GJ. A plasma inhibitor of ristocetin-induced platelet aggregation in patients with sickle hemoglobinopathies. Am J Hematol 1977;2:251-8. Sarji KE, Eurenius K, Fullwood CO, Schraibman HB, Colwell JA. Abnormalities of platelet aggregation in sickle cell anemia. Presence of a plasma factor inhibiting aggregation by ristocetin. Thromb Res 1979;14:283-97. Visudhiphan S, Ketsa-Ard K, Tumliang S, Piankijagum A. Significance of blood coagulation and platelet profiles in relation to pulmonary thrombosis in beta-thalassemia/Hb E. Southeast Asian J Trop Med Public Health 1994;25:449-56. Buchanan GR, Holtkamp CA, Levy EN. Racial differences in ristocetin-induced platelet aggregation. Br J Haematol 1981;49:455-64. Flood VH, Gill JC, Morateck PA, Christopherson PA, Friedman KD, Haberichter SL, et al. Common VWF exon 28 polymorphisms in African Americans affecting the VWF activity assay by ristocetin cofactor. Blood 2010;116:280-6.